On Monday, the International Energy Administration released a new report that projects that the US will pass Saudi Arabia as the world’s leading producer of oil in 2020. U-S-A! U-S-A! “The United States, which currently imports around 20% of its total energy needs, becomes all but self sufficient in net terms—a dramatic reversal of the trend seen in most other energy importing countries,” the IEA concluded. The projection, of course, flies in the face of the allegation that President Obama has destroyed the oil and gas industry in the US with his crushing regulatory agenda. He hasn’t. Crude oil production actually increased 14 percent between 2008 and 2011. 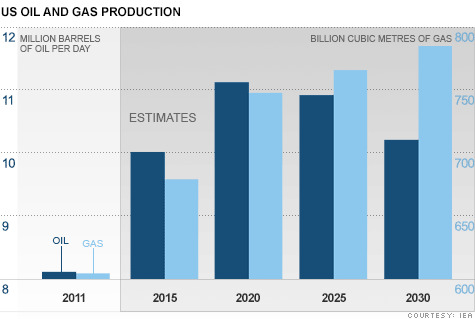 Yet the amount of oil we produce is expected to decline again after 2020. Saudi Arabia is expected to retake the global lead by 2030. So maybe we should be thinking about a Plan B.